The most immediate benefit that a site gains from deploying Bro is an extensive set of log files that record a network’s activity in high-level terms. These logs include not only a comprehensive record of every connection seen on the wire, but also application-layer transcripts such as, e.g., all HTTP sessions with their requested URIs, key headers, MIME types, and server responses; DNS requests with replies; SSL certificates; key content of SMTP sessions; and much more. By default, Bro writes all this information into well-structured tab-separated log files suitable for post-processing with external software. Users can however also chose from a set of alternative output formats and backends to interface directly with, e.g., external databases. In addition to the logs, Bro comes with built-in functionality for a range of analysis and detection tasks, including extracting files from HTTP sessions, detecting malware by interfacing to external registries, reporting vulnerable versions of software seen on the network, identifying popular web applications, detecting SSH brute-forcing, validating SSL certificate chains, and much more. However, the key to understanding Bro lies in realizing that even though the system comes with such powerful functionality out of the box, fundamentally it represents a platform for traffic analyses that’s fully customizable and extensible: Bro provides users with a domain-specific, Turing-complete scripting language for expressing arbitrary analysis tasks. Conceptually, you can think of Bro as a “domain-specific Python” (or Perl): just like Python, the system comes with a large set of pre-built functionality (the “standard library”), yet you are not limited to what the system ships with but can put Bro to use in novel ways by writing your own code. Indeed, all of Bro’s default analyses, including all the logging, is the result of such scripts; there’s no specific analysis hard-coded into the core of system. Bro runs on commodity hardware and hence provides a low-cost alternative to expensive proprietary solutions. Despite the price tag, however, Bro actually goes far beyond the capabilities of other network monitoring tools, which typically remain limited to a small set of hard-coded analysis tasks. We emphasize in particular that Bro is not a classic signature-based intrusion detection system (IDS). While it supports such standard functionality as well, Bro’s scripting language indeed facilitates a much broader spectrum of very different approaches to finding malicious activity, including semantic misuse detection, anomaly detection, and behavioral analysis. A large variety of sites deploy Bro operationally for protecting their cyberinfrastructure, including many universities, research labs, supercomputing centers, open-science communities, and major corporations. Bro specifically targets high-speed, high-volume network monitoring, and an increasing number of sites are now using the system to monitor their 10GE networks, with some already moving on to 100GE links. Bro accommodates such high-performance settings by supporting scalable load-balancing: large sites typically run “Bro Clusters” in which a high-speed frontend load-balancer distributes the traffic across an appropriate number of backend PCs, all running dedicated Bro instances on their individual traffic slices. A central manager system coordinates the process, synchronizing state across the backends and providing the operators with a central management interface for configuration and access to aggregated logs. Bro’s integrated management framework, BroControl, supports such cluster setups out-of-the-box. Bro supports a wide range of analyses through its scripting language. Yet even without further customization it comes with a powerful set of features. Timeline of Bro’s History (click to enlarge). Bro’s history goes back much further than many people realize. Vern Paxson designed and implemented the initial version more than two decades ago. Vern began work on the code in 1995 as a researcher at the Lawrence Berkeley National Laboratory (LBNL). Berkeley Lab began operational deployment in 1996, and the USENIX Security Symposium published the original Bro paper in 1998 (later refined in a subsequent journal publication). In 2003, the National Science Foundation (NSF) began supporting research and advanced development on Bro at the International Computer Science Institute (ICSI), where Vern now leads the Networking and Security group. Over the years, a growing team of ICSI researchers and students kept adding novel functionality to Bro, while LBNL continued its support with funding from the Department of Energy (DOE). Much of Bro’s capabilities originate in academic research projects, with results often published at top-tier conferences. However, the key to Bro’s success was its ability to bridge the traditional gap between academia and operations from early on, which provided the research with crucial grounding to ensure that developed approaches stand up to the challenges of the real world. Yet, with Bro’s operational user community growing over time, the research-centric development model eventually became a bottleneck to the system’s evolution: research grants do not tend to support the more mundane parts of software development and maintenance, even though those prove crucial for the end-user experience. While Bro’s capabilities always went beyond those of traditional systems, a successful deployment used to require significant technical expertise, typically with a large upfront investment in tackling Bro’s steep learning curve. In 2010, NSF set out to address this gap by awarding ICSI a grant dedicated solely to Bro development out of its SDCI program. With that support in place, the National Center for Supercomputing Applications (NCSA) joined the team as a core partner, and the Bro Project began to completely overhaul many of the user-visible parts of the system for the 2.0 release. Since that version came out, Bro has experienced an tremendous growth in new deployments across a diverse range of settings, and the Bro team is now working to build on this success by further advancing the system’s capabilities to address the challenges of future networks. Architecturally, Bro is layered into two major components. 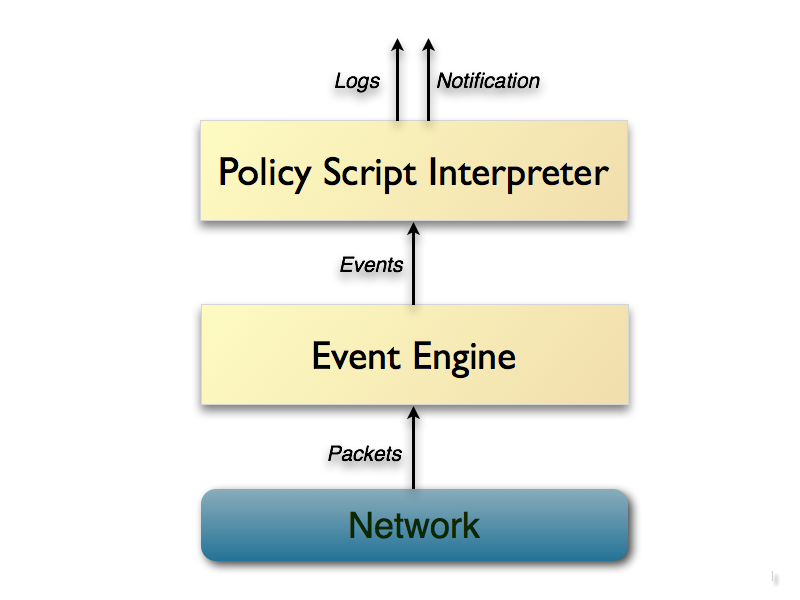 Its event engine (or core) reduces the incoming packet stream into a series of higher-level events. These events reflect network activity in policy-neutral terms, i.e., they describe what has been seen, but not why, or whether it is significant. For example, every HTTP request on the wire turns into a corresponding http_request event that carries with it the involved IP addresses and ports, the URI being requested, and the HTTP version in use. The event however does not convey any further interpretation, e.g., of whether that URI corresponds to a known malware site. Such semantics are instead derived by Bro’s second main component, the script interpreter, which executes a set of event handlers written in Bro’s custom scripting language. These scripts can express a site’s security policy, i.e., what actions to take when the monitor detects different types of activity. More generally they can derive any desired properties and statistics from the input traffic. Bro’s language comes with extensive domain-specific types and support functionality; and, crucially, allows scripts to maintain state over time, enabling them to track and correlate the evolution of what they observe across connection and host boundaries. Bro scripts can generate real-time alerts and also execute arbitrary external programs on demand, e.g., to trigger an active response to an attack.